Imagine 30 horsemen thunder towards you brandishing spears, their extraordinary helmets glittering in the sun. Would you stand your ground? The visual impact of a Roman cavalry charge would have been huge. Projecting power and force, the cavalry represented the full might of the Roman Empire. The Roman army used the cavalry to cover its flanks in battle and provide shock tactics. Their disciplined ranks of galloping horses easily dispersed fighters on foot. Cavalrymen could also pursue the enemy when retreating. Due to their rapid deployment, cavalry troops usually had decisive impact on a battle. Over the Roman period the cavalry developed to include lightly armoured mounted archers and heavy cavalry lancers. Both rider and horse wore metal armour to protect the body. Horse-mounted troops also carried out long-range reconnaissance and could quickly deliver urgent messages across great distances. Roman saddles did not have stirrups. This meant that the rider had to have exceptional control and balance to be able to handle a horse, especially at speed. As well as being able to ride well, cavalrymen had to cope with the weight of amour and the difficulty of wielding weapons. The cavalry were a valued part of the Roman military machine. Cavalrymen were recruited from areas of the Empire with a tradition of mounted warfare. In particular this included northern Europe. Better paid than the foot soldiers (infantry), they were the elite troops on Hadrian’s Wall. They could afford to equip themselves with expensive status symbols such as ornate helmets and decorative equipment for their horses. How many in each elite unit? 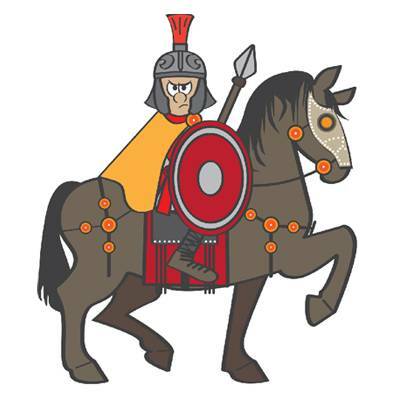 An elite Roman cavalry unit was known as the ala milliaria. Milliaria means 1,000 strong, but in practice these alae usually contained around 800 horsemen. These were arranged in 24 turmae, meaning troops. An ala had a daily range of around 80km and could control a large area of the frontier. Where were the elite units stationed? "I am part of the largest cavalry regiment on Hadrian's Wall, the ala Petriana. It is only right that we have the largest fort on Hadrian's Wall and the most important commander."